I'm so glad that you stopped by today! 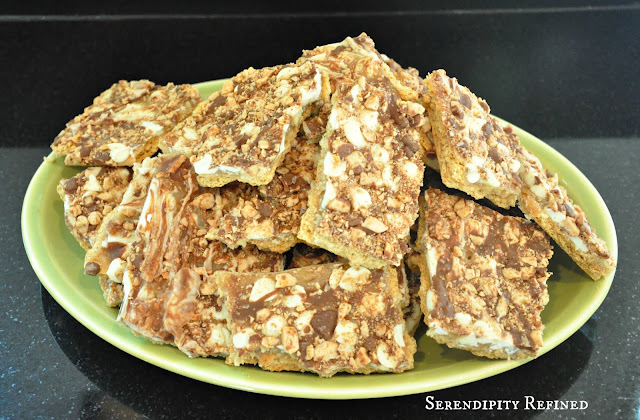 Today's closing day (insert happy dance here) at the French Farm and to celebrate, I've made a batch of Maureen and Aunt Barb's White Chocolate Toffee Bars...or, as our close friends and family call it, "Aunt Barb's crack". As my days of cooking and baking in the kitchen at 127 draw to a close, I have begun to wake up in the night screaming realize that there are going to be some challenges to face in the temporary kitchen at the French Farm Project. For example, I'm going to learn to cook on a 1980's electric stove with a broiler drawer and bake in an electric oven with no light in it. No big deal....all kitchens have a few quirks, right!? Besides, who am I kidding?! It's not like I'm a fancy cook...most of what I make has fewer than eight ingredients and takes under an hour to prepare. Like this recipe: Six Ingredients...under 30 minutes of prep and about an hour to freeze. 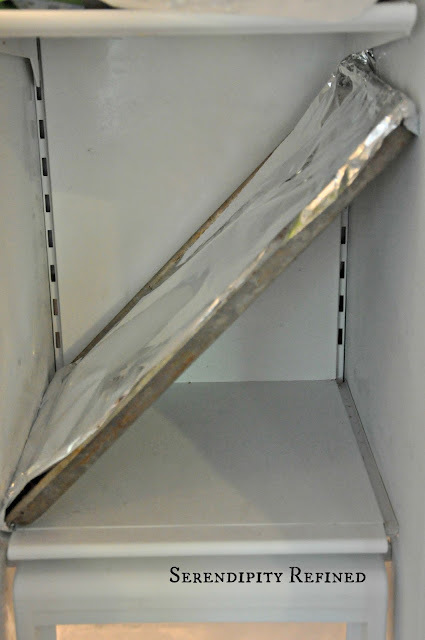 First, cover a baking sheet or bar pan with aluminum foil. This step is important. No, it's not because most of my bake ware belonged to my grandmother and mother in law and was probably made right after they discovered aluminum, nor is it because I don't want you to see that the edges of the pan have brown stuff that's been baked onto them since 1990...that's not it. It's because you won't be able to get the bars out of the pan if you don't do this very important step....trust me...it's not pretty if you don't. or, you could do what I usually do when I'm so excited that I can't focus because I'm finally closing on the French Farm in about five hours pressed for time: buy them. Yep...use them right out of the cardboard box. 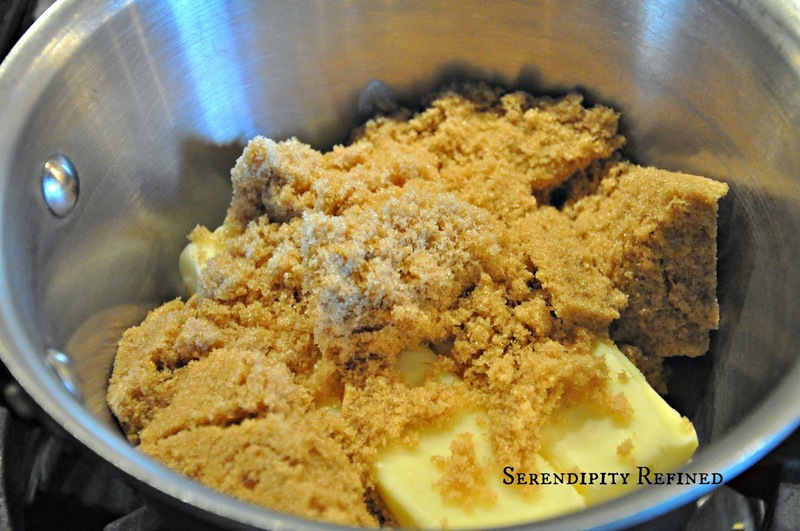 Dump the butter and the brown sugar into a sauce pan and melt it over medium/high heat, stirring constantly. Or, turn the heat down a little and run down the basement to gather painting supplies and a drop cloth then turn the heat back up when you're ready to pay attention. The mixture needs to come to a boil. 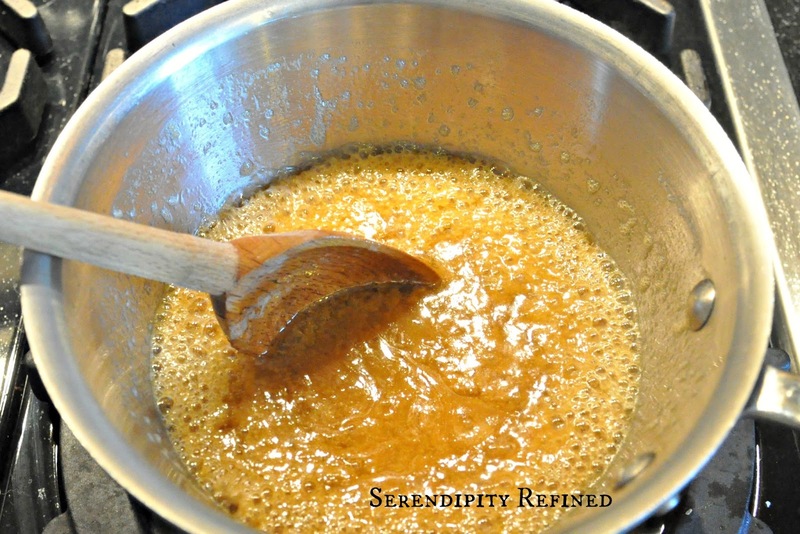 Boil it for a few minutes until it begins to caramelize. Watch the heat and keep stirring, you don't want the sugar to burn! Burned sugar leaves a smell in your home that lasts for days. Not a good thing if you're selling...thank heavens that's almost behind me! While the spoon is cooling, place the cookie sheet into an oven which has been preheated to 350 degrees. 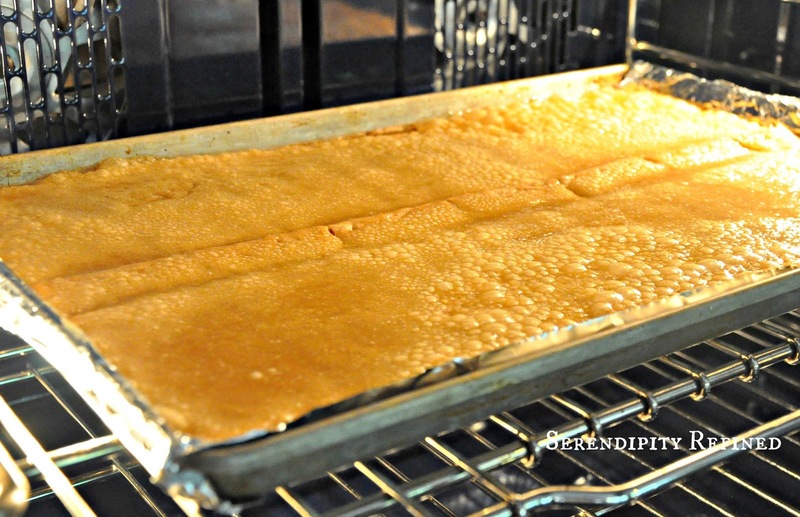 Bake for a few minutes until the sugar starts to bubble. 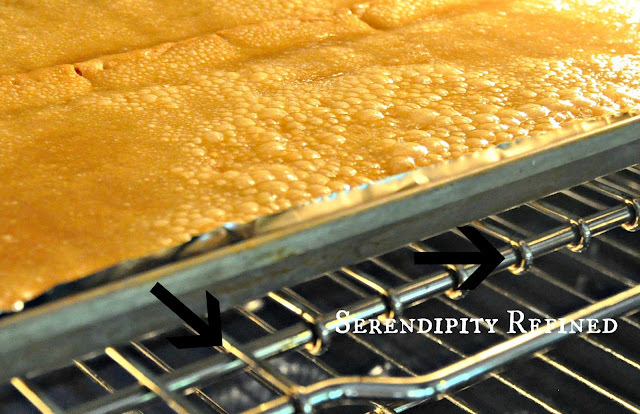 Pause to realize that seeing the sugar bubble may be a challenge in your new oven which you realize may not even have a window in the door, let alone a light. ...Remind yourself that all kitchens have quirks. Notice how incredibly clean your oven racks are and wonder for just a fleeting moment just how bad the grime will be on the oven at the French Farm after having been vacant and or used as a rental for the last two years. Sit down, have a large glass of tea, add oven cleaner to the list of things to purchase at the hardware store. Remove the pan from the oven and top with an entire bag of white chocolate chips and an entire bag of Heath toffee bar bits. Give yourself a high five because you just used up two bags and a box from the pantry which means that you'll have less to move! Yep....that's right....there's not enough room in my current freezer for a cookie sheet to lie flat. 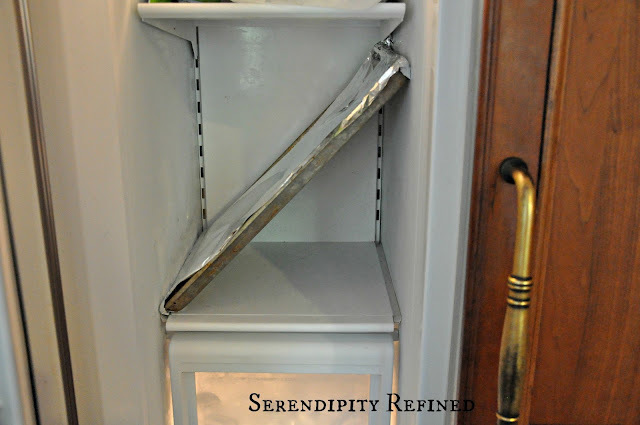 Take another sip of tea and add wide freezer shelf to the list of things that you'd like in your new kitchen. 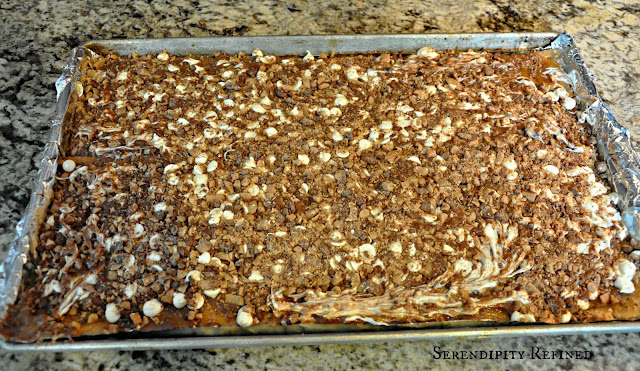 Freeze the bars for an hour (or more if you can keep your children away from it). Remove the pan from the freezer, break the bars into chunks. Store them in a zipper bag in the freezer. Yeah, who am I kidding?! There's never any to actually store. You can try putting pieces into a zipper bag and putting it into the freezer but truly, why waste a perfectly good plastic bag!? 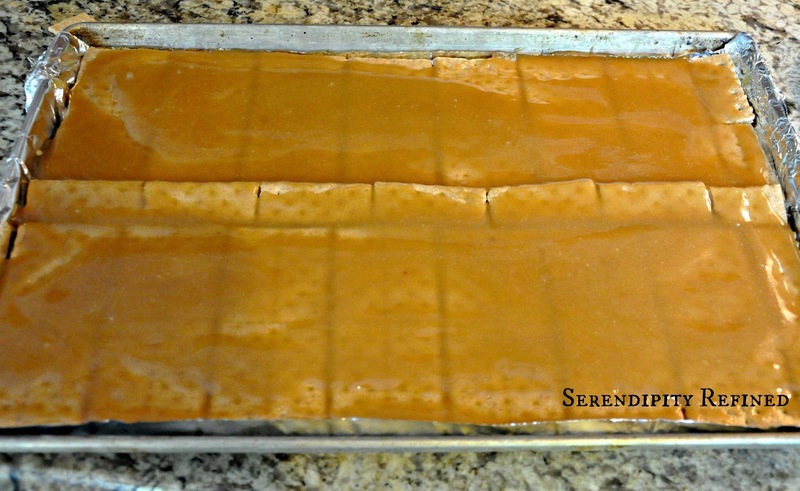 In a medium sauce pan over medium/high heat, melt 1 cup butter and 1cup of brown sugar and bring to a boil. Continue boiling until it begins to caramelize. Pour the mixture over the graham crackers and place into a 350 degree oven for 3 to 5 minutes until the sugar bubbles. 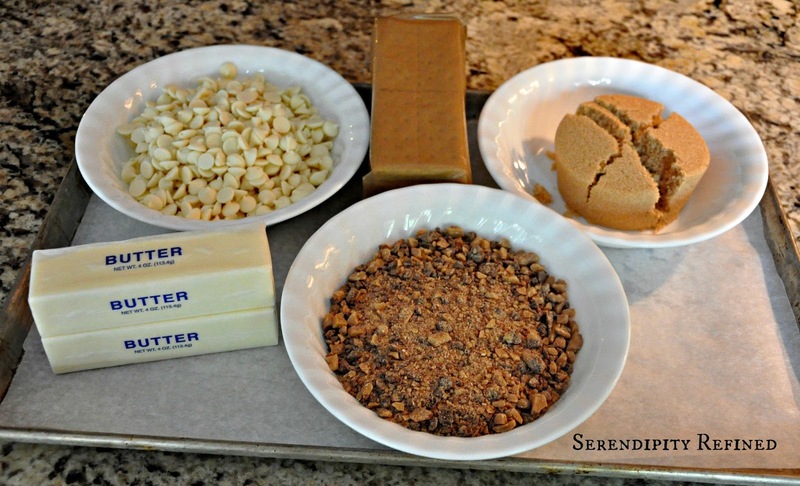 Remove from oven and immediately spread a package of white chocolate chips over the crackers. 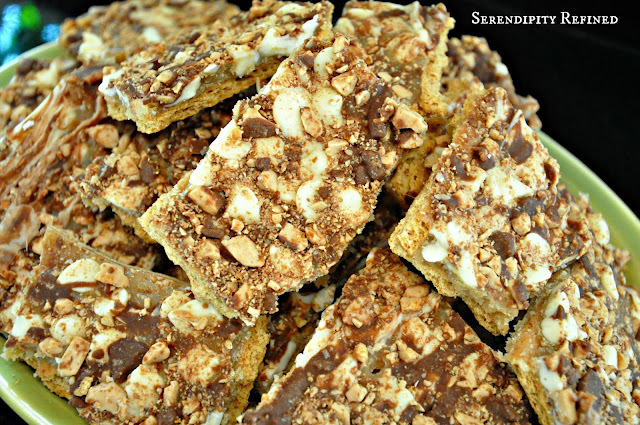 Top the white chocolate chips with a package of Heath Bar Bits. Cover with Foil and freeze for one to two hours. Store leftovers in a bag in the freezer. So, there you have it. 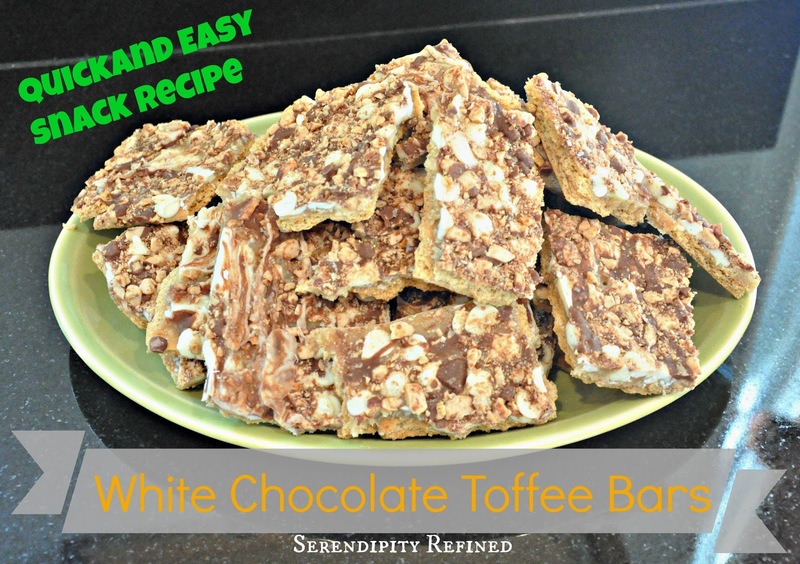 A super easy, white chocolate, toffee, graham cracker bar that's fast...and addictive. It's finally after six a.m. and off to Home Depot for supplies! Closing is in FOUR HOURS!! !